Kostas Grigoréas (Gree-go-réh-as) was born in Athens in 1957. He has studied guitar and theory. 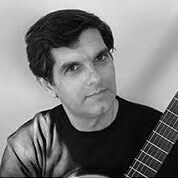 He started his guitar studies with Yannis Andreopoulos and he continued with Dimitris Fampas. His activities include solo recitals, song accompaniment, composition and teaching.